I love to eat at restaurants. I think I get it from my mom - she's always game to try out a new restaurant. Unfortunately, the bitter cold winter we are having has me more inclined to hide out indoors. This past weekend, though, we headed out to the Ontario Science Centre to check out some of their new exhibits like "The Human Edge." 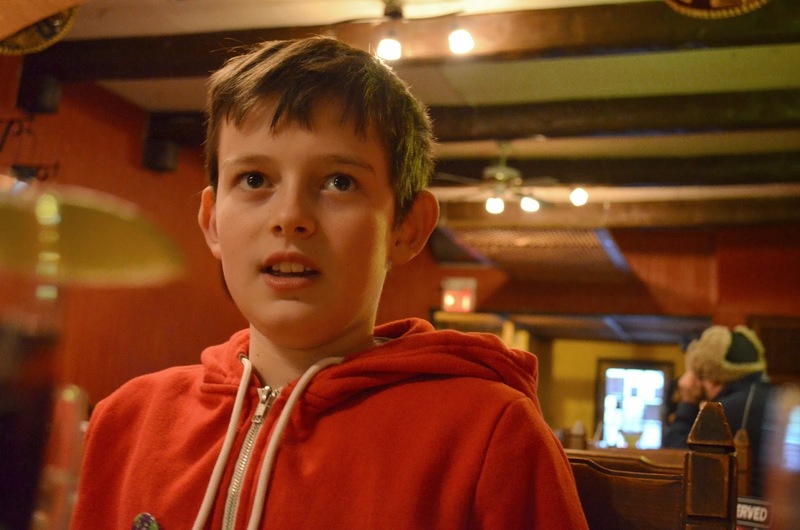 All that science made us hungry so we decided to pay a visit to Rancho Relaxo, a Toronto Mexican restaurant. Although I have long been familiar with the name, this was our first time going there. 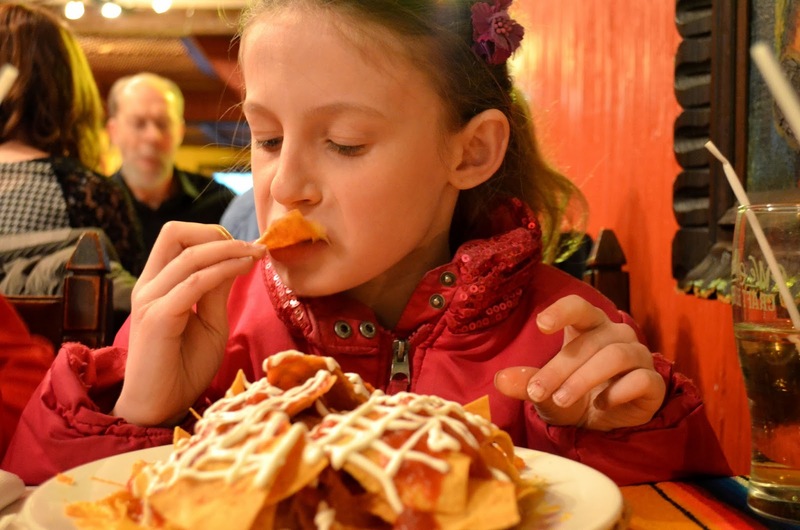 That's my little gal, above, eating a plate of House Nachos. She is so picky that she's hard to order for at a restaurant. Hence the appetizer for dinner. Thankfully she really enjoyed this plate of corn chips topped with salsa, cheese and sour cream. Then there's this guy. He will pretty much eat anything his dad and I eat, however, he is very reluctant to try out new restaurants. He argued with me half the way to the restaurant. He wanted to know what Rancho Relaxo gets for online ratings. He was incredulous to discover that I hadn't done any research. I guess it's a generational thing - I prefer to just try the food myself. Despite his reluctance, he usually ends up being happy in the end, as he was again on this occasion. Here's the dinner I chose - a burrito with faux chicken, vegan cheese and vegan sour cream. Rancho Relaxo also serves meat dishes, but they have a great selection for vegetarians and vegans. 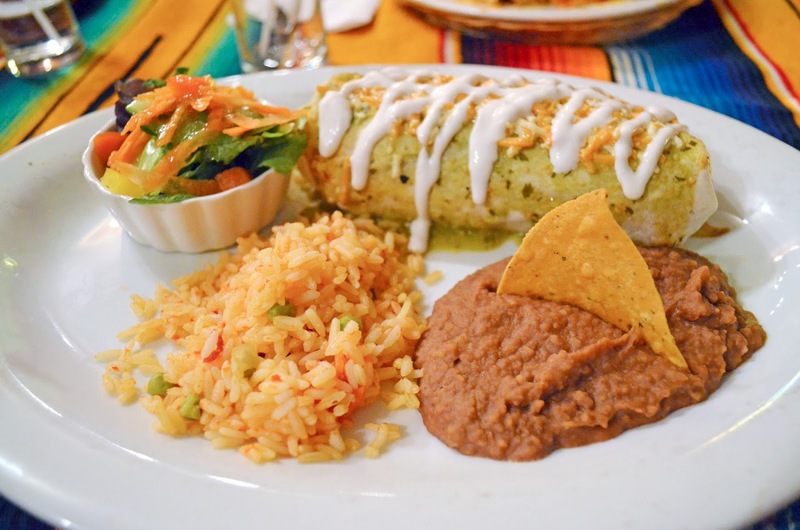 Many of the dishes can be made with faux chicken, faux steak or simply refried beans and veggies. I'm not used to having so many options, actually, so it took me longer than usual to decide. I was happy with my meal of a burrito, refried beans and Mexican rice. We'll be going back to Rancho Relaxo again...when it's warm outside. 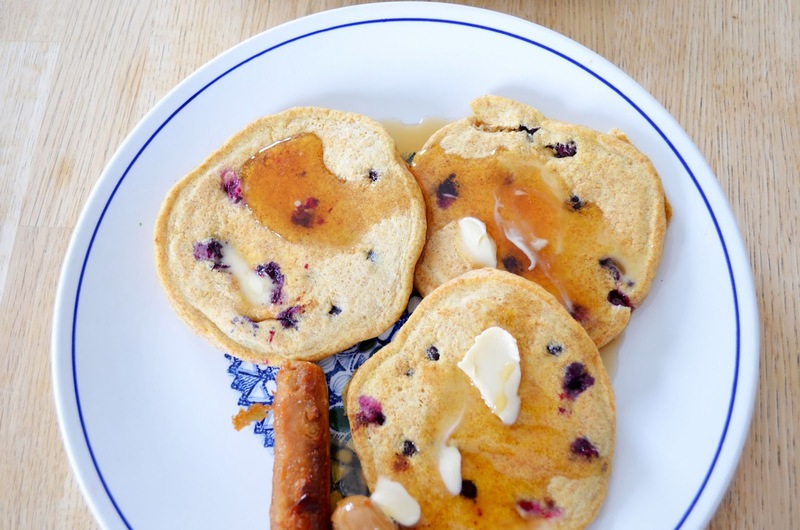 On Sunday morning, I decided a breakfast of pancakes with blueberries and vegan sausage was in order. I find a warm breakfast is a great comfort on these frigid days. Now for my What I Ate Wednesday look at Tuesday's eats. It probably wasn't the best day to record here, as I was feeling rather lazy. 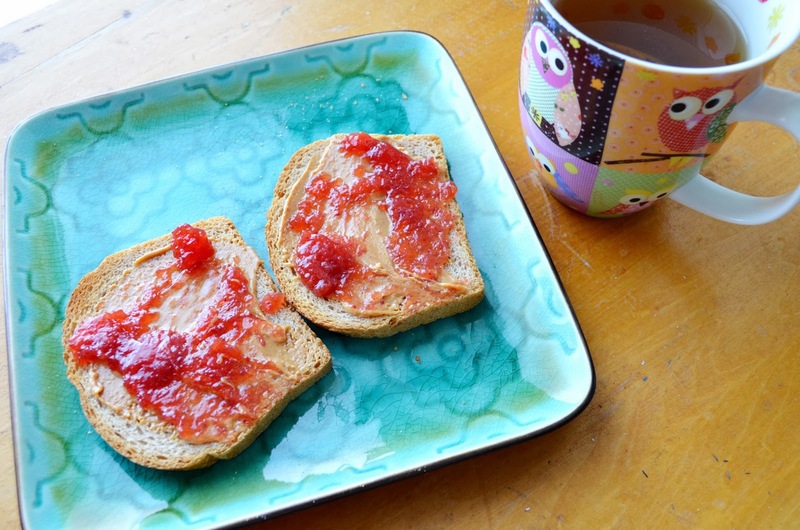 I started the day with spelt bread toasted and topped with peanut butter and jam. I know, boring. I had my usual decaf green tea. 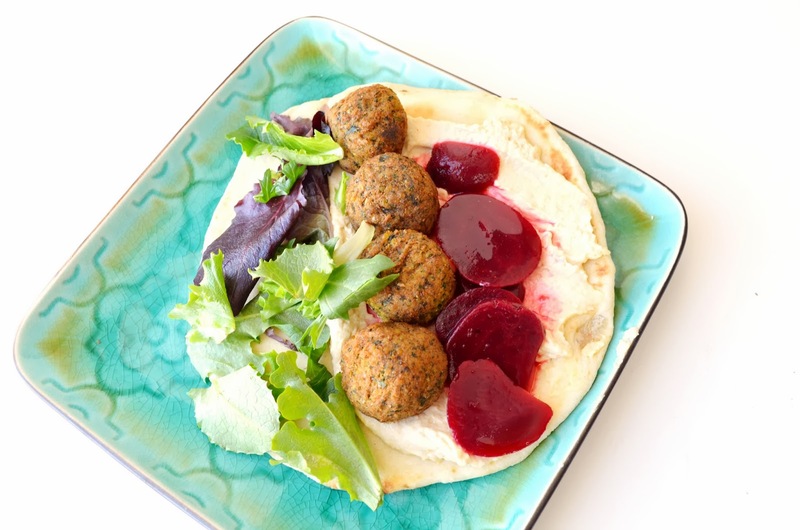 Lunch was a warmed naan bread topped with falafel, hummus, beets and lettuce. 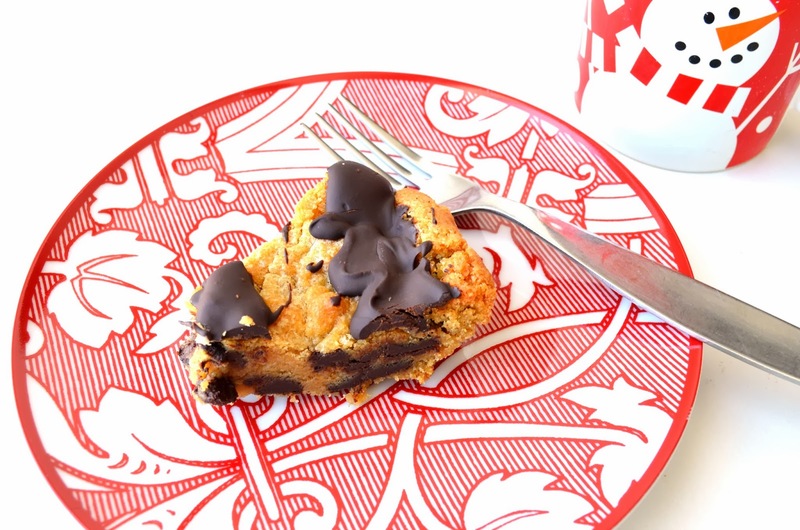 Rather than going back to the kitchen for salad as I had planned, I chose a slice of the vegan Chocolate Chip Cookie Heart that I had prepared for yesterday's post. Like warm breakfasts, sweet, chocolate goodness helps me through these dreary winter days. That's my excuse anyway. 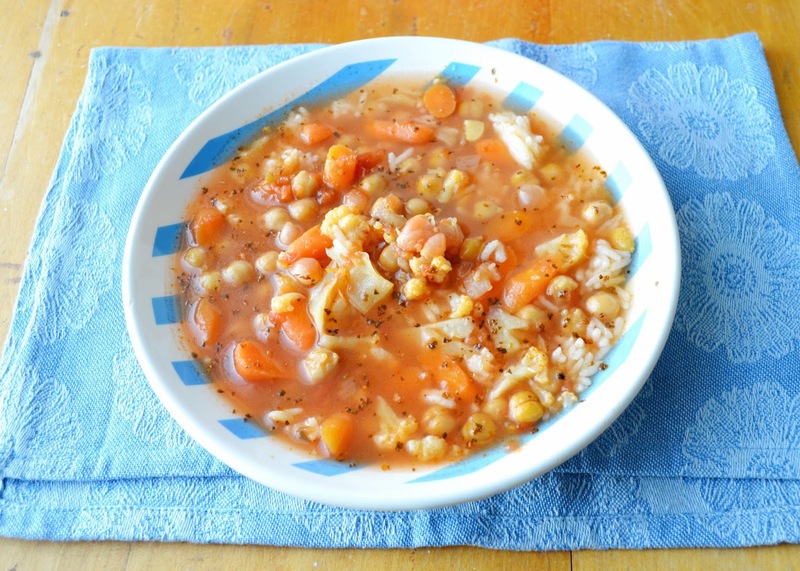 For dinner, I made a nurturing minestrone soup with rice. Then I had another falafel sandwich. Then I had another slice of the chocolate chip dessert. Again no salad. How do you get through the cold days? I would like to go to that restaurant!! Mexican AND vegetarian options? Count me in! Mmm, soup is a go to for me in the winter, too. Your minestrone looks so good! oh that all looks fab, especially your meal eating out! I love trying new places too. In winter I survive with lots of hot tea but unfortunately I tend to eat biscuits (cookies) with them, hence now being on a diet! That Mexican restaurant is my dream! We have tons of Mexican restaurants here but I'm lucky to make do with rice and beans - so many choices would be wonderful! She is looking more & more like you Joann (or dare I say a young me). He is looking even more grown up all the time. Yum!! We'll be heading out to our favorite Mexican place tomorrow evening for Bayley's birthday margarita! Oh, summer...yes, we can dream! !